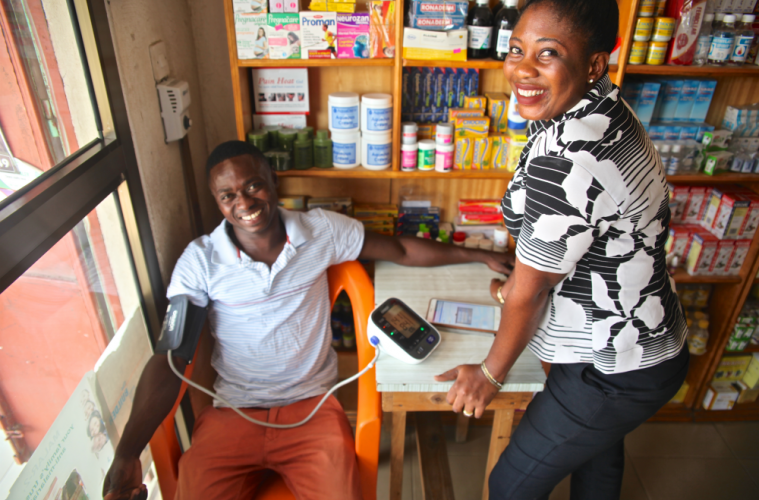 BASEL, Switzerland, November 27, 2018/ — Innovative ComHIP project in Ghana shows that bringing healthcare closer to where people live, work and shop effectively tackles hypertension – the most deadly non-communicable disease; Digital health tools were a key enabler in the program; The control rate of people with hypertension enrolled and retained in the program for over a year climbed from 36% to 72%; The Ghanaian government is integrating the model into national policy and plans to scale-up to additional regions; This form of community-based care could save millions of lives in other countries and for other NCDs. Today, the Novartis Foundation and partners announced the results of an innovative approach to hypertension management in Ghana. The community-based hypertension improvement project (ComHIP) tested a new model to detect, diagnose and treat hypertension earlier by placing screening points in local shops and businesses and strengthening existing facilities. This captured patients beyond the reach of traditional health facilities. Digital health tools connected the new screening points with community health workers and physicians; supported nurses’ decision-making; and empowered patients to self-manage their condition through messages sent to their mobile phones. For people enrolled and retained in the program for over a year, hypertension control rates rose from 36% to 72%. The ComHIP results demonstrate the huge potential of community-based care and suggest that the method could save millions of lives if replicated in other countries and for other non-communicable diseases (NCDs). In addition to improving hypertension control rates, participants enrolled and retained in the program for over a year experienced an average reduction of 12mmHg in systolic blood pressure and an average reduction of 7mmHg in diastolic blood pressure. ComHIP is important because in Ghana, just 4%  of people with hypertension have their condition controlled, compared to 53% in the USA. Hypertension is the leading risk factor for cardiovascular disease – the most deadly non-communicable disease. The project was implemented in partnership with the Ghana Health Service, FHI360, The Ghana School of Public Health, and The London School of Hygiene & Tropical Medicine. The success of the three-year ComHIP pilot led the Ghanaian government to integrate the project training curriculum and treatment guidelines into Ghana’s national policy, and commit to scaling-up the program to additional regions. The Novartis Foundation is a philanthropic organization which strives to have sustainable impact on the health of low-income communities through a combination of programmatic work, health outcomes research, and its translation into policy to tackle global health challenges. We work hand-in-hand with local and global partners to catalyze sustainable healthcare models to improve access and health outcomes, and to accelerate efforts to eliminate leprosy and malaria by focusing on interventions that aim to interrupt transmission. Everything we do is grounded in evidence and innovation, and our work is a continuous cycle of evaluation, adaptation and application. In 2017, the operational budget for the Foundation was CHF 15 million and our programs reached 7 million people.